The Alpine Eternity Collection is a magnificent array of skillfully hand-crafted table-top fountains. Designed by a team of gifted artisans, each of these exquisite pieces creates a striking focal point wherever they are placed. The fountains' gently flowing water provides a calming effect as they soothe nerves and restore body, mind, and spirit. Indoor fountains offer the added benefit of covering up distracting ambient noises, helping raise alertness and focus. Stones and greenery are included as shown. Pump and all necessary parts included for easy assembly and operation. A continuous cycle of running water generates calming background noise. The faux-stone finish is timelessly elegant. Relax to the soft sounds of trickling water, and achieve the look of class by enhancing the decor of your home or office. Order Yours Today! 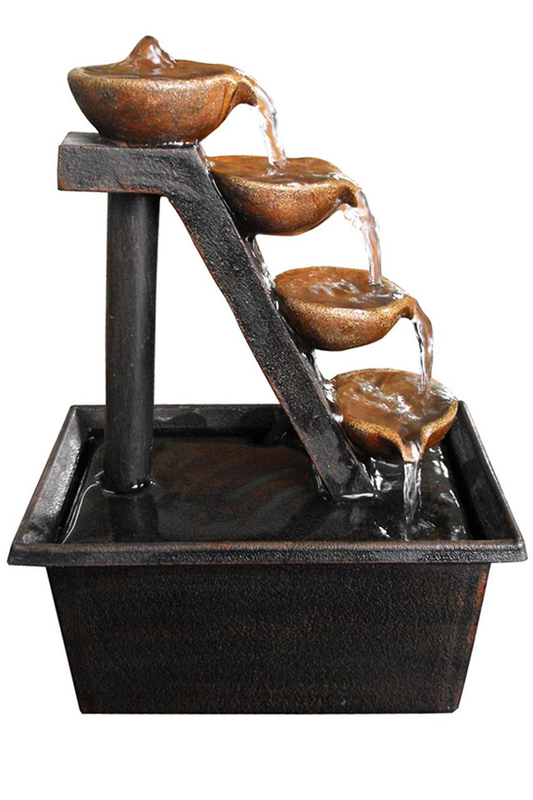 Dimensions (L x W x H) 6" x 4" x 8"
The Tiered Steps Fountain - Perfect for any indoor space. This uniquely styled unit will enhance the decor of any home or office. Lightweight materials and a small footprint make it easy to place it almost anywhere. Order Yours Today! Natural Stone Styled Water Feature From Alpine. Water and Mist Fountain with Illuminated Rolling Ball. Lighted Water Feature For Indoor Or Outdoor Use. A Colorful, Indoor Water Feature That Also Holds Fresh Flowers.